Hello and welcome back to the Therapy Spot! This week, let’s talk about how IFS can help with bad habits and addiction. My friend’s mother — let’s call her Frances — used to bite her fingernails. She tried everything to stop that habit! First, she put stickers on her nails, but she always removed them without even noticing. Then, she painted her nails with a bitter substance, but even the bad taste couldn’t stop her. Naturally, Frances felt extreme frustration with herself. Why couldn’t she stop, even though she wanted to? She looked at her bitten-down fingernails and wondered, “Who’s actually in charge here?” Now, unless you’re a professional hand model, biting your fingernails doesn’t really negatively impact your life. But maybe you can relate to how Frances felt. Maybe you have a bad habit, or even an addiction, you just can’t seem to shake. Over the course of our lives, we all acquire behaviors and habits that we wish we could change. While it may seem impossible, we do have the power to change our brains. In order to do so, however, you might need to make some internal adjustments. 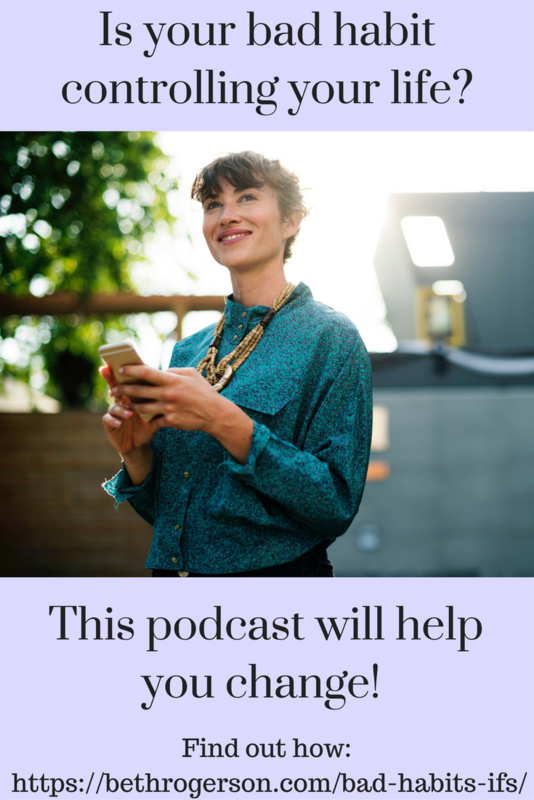 Whether you practice self management as part of your recovery from addiction, or you feel you’re addicted to bad habits in your life, this podcast is for you. Let’s map out your internal system. I want you to envision three concentric circles. The outermost circle contains your manager parts: your critic, planner, organizer, and so on. These parts make sure you get out of bed, go to work on time, and load the dishwasher. Next, you have your firefighters. Firefights spring into action when we feel bad, or when the managers don’t show up. They do something enjoyable to immediately help us feel better, no matter the consequences. Finally, at the innermost circle, you find your exiles. Exiles hold strong beliefs such as “I’m not good enough” that usually stem from our childhoods. True to their name, we do everything we can to keep exiles “out of sight, out of mind.” We can only do this for so long, however. Eventually, something in the present triggers our exiles, and we have a strong emotional reaction. How does this play out in terms of behavior and addiction? Let’s say you get passed over for a promotion at work. The event triggers an exile — “I’m not good enough” — and you panic. What can you do to feel better? Your firefighters leap into action and you pour the wine, drive fast cars, go shopping, or crawl into bed. For the moment, the fire is extinguished, and you feel better. The next day, however, your managers get back to work. Their first order of business? To shame you for whatever you did to feel better. After all, you don’t want this happening again! Your critic comes out swinging, and you feel bad all over again. The cycle repeats, and habits form. What is its role in your life and how does it help you? Why does it feel the need to be so large or extreme? What does it believe you need? When you approach this part with your calm, curious, clear mind, you can discover its triggers. Listen to this part as you would listen to a good friend. Remember: no matter how they go about it, all your parts want to help you. Let’s go back to Frances for a moment. Through interviewing her parts, she discovered the root of her nail-biting urge. As an energetic child, her mother often reprimanded her for fidgeting or not sitting still. Frances began to bite her nails as a way to burn off all that energy without upsetting her mother. Once she realized this, she understood why her previous efforts had failed. She didn’t need bitter nail polish or gloves: she just needed a different way to expend her restless energy! Frances invested in stress balls, worry rings, and Silly Putty to keep her hands busy, and left her nail biting days behind. When you welcome and listen to your exiles, they won’t feel the need to hijack you. I encourage all of you to practice this inner dialogue with your different parts when you feel the urge to call in the firefighters. Yes, this may feel uncomfortable at first, but remember: discomfort can be incredibly productive. If you’re new to the process, my latest book, Be the One to Heal Yourself, is an excellent starting point. “Mid Autumn Fest” by Flickr user Photo by Thomas, licensed under CC BY 2.0. Share the post "Bad Habits and IFS: Change Your Perspective, Change Your Self"